How Can Kindness Improve Our Wellbeing? Evidence consistently shows that positive relationships and kindness are at the heart of our wellbeing. In this discussion paper Carnegie Associate Zeo Ferguson starts a process to engage directly with people who want to inject kindness into their work and communities. The paper explores evidence concerning the impact of everyday relationships and kindness on wellbeing for society as well as individuals. It also addresses the issues of community empowerment and develops a theory of change. 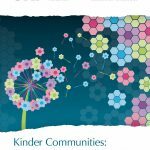 The project aim is to learn with communities and organisations to develop practical approaches to encourage kinder communities.